Sonax Wheel Cleaner UNIVERSAL - Brakeswap.com - Friction for the Win! Sonax500mLSpray Simply the best. 500mL spray bottle. Cleans off the toughest of track brake dust! Safe and effective removal of brake dust and stubborn dirt. Even removes the worst of track brake dust. SONAX Full Effect Wheel Cleaner is a highly effective, acid-free and pH balanced rim and wheel cleanerthat is safe for all wheels, including aluminum and alloys. This formulation is also effective and safe for use on painted wheels andwill not deteriorate clear coats. 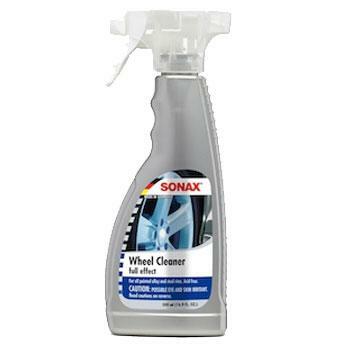 SONAX Full Effect Wheel Cleanercontains unique chemical ingredients that effectively dissolves thesintered iron by forming a water soluble iron complex. During the useof your vehicle, brake dust and road grime become sintered to thesurface of rims and wheels due to the high temperature conditions theyare normally exposed. Brake dust contains high levels of iron and oncesintered to the rim, becomes extremely difficult to dissolve or removewithout the use of harsh chemicals. SONAX Full Effect Wheel Cleaner sprayson as a thick, flourescent grean foam. As the cleansing foam begins towork into the dirt and grime, the formula begins to turn red. The redcoloration is the SONAX Wheel Cleaner forming a bond to the sinterediron on the wheel and changing its state to a water soluble complex foreasy removal. Stubborn, baked on grime may take a small amount ofagitation. 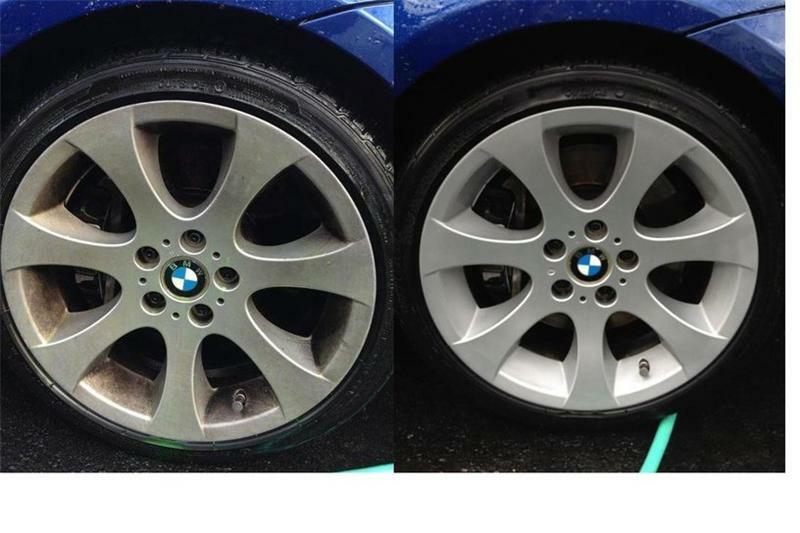 Rinse wheels thoroughly with a power washer and wipe dry. Depending upon soil level, allow to stand 3 to 5 minutes. Cleaner turns red upon contact with sintered iron particles. This is a normal reaction. Do not allow SONAX Wheel Cleaner to dry onto the wheels after applying the product.